The Dutch agency heading the international probe into Malaysia Airlines MH17 crash in eastern Ukraine has contacted RT over the footage used in our recent documentary on the tragedy. RT’s documentary discovered fragments of the plane still in Donetsk. The RT Documentary film, titled “MH17: A year without truth,” showed fragments of the crashed Boeing and pieces of luggage still scattered in the area at the time of filming. The RTD crew collected the parts of the plane’s exterior they spotted, bringing them to the administration of the nearby town of Petropavlovsk. "With great interest we watched your documentary, ‘MH17: A year without truth,’” Dutch Safety Board spokesperson Sara Vernooij wrote to RT. “In this film, RT shows parts of the cockpit roof which were found near Petropavlivka. We would like to gather those pieces and bring them over to the Netherlands so the Dutch Safety Board can use them for the investigation and the reconstruction." In the documentary, the RTD crew talked to witnesses, experts and family members of flight MH17 passengers in a bid to understand whether the truth of what caused the tragedy will ever be established. You can watch the film here. The documentary also features relatives of those who perished in the MH17 crash who say they have no possibility to get information about the course of the investigation, and believe it is not objective. RT’s Roman Kosarev has recently visited Petropavlovsk and talked to the town’s mayor, Natalya Voloshina, who coordinates the collection of fragments in the regional administration. She explained that all the parts of the wreckage found by the locals are stored, awaiting their retrieval by Dutch investigators. The investigators advised locals to save any plane parts found from the crash at a meeting with Natalya Voloshina in May, adding that they would try to collect them later. They have since been in touch via email and phone. While no date to pick up the newly found objects has been set, the investigators asked for photographs of the finds. Moving the objects can be difficult and local residents who find them sometimes bring the parts themselves if they are small enough, but otherwise the district has created a team that collects the wreckage. Voloshina said she was puzzled that no one had instructed local officials what to do with the wreckage in the aftermath of the crash, and when the fragments were being collected by the experts. She finally established contact remotely and received instructions. For people, she said, it is not just a duty – many volunteered to comb the fields for remains and plane parts – but a psychological issue, as the wreckage is constant reminder of the tragedy and of the war in general. With the town itself still recovering after fighting in the area, the woman says she hopes the story of MH17 will finally reach its conclusion. 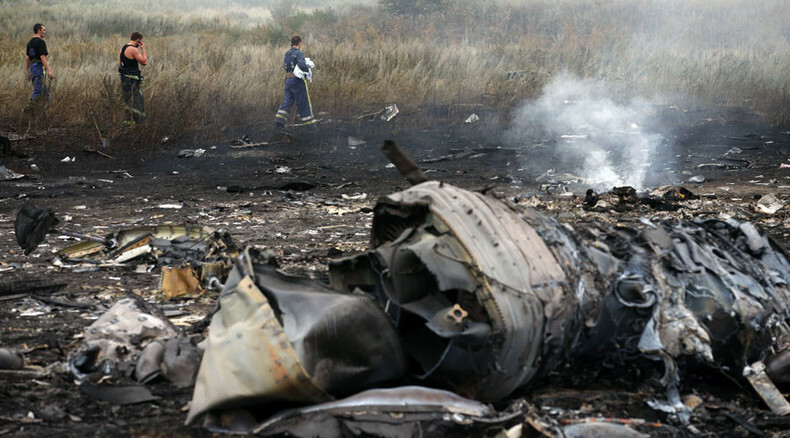 Malaysia Airlines Flight MH17 crashed in Donetsk Region on July 17, 2014, killing all 283 passengers and 15 crew members aboard. With the sides of the Ukrainian conflict still blaming each other for the tragedy with no conclusive proof, the world awaits the results of the Dutch-led international probe, which are due to be published in October. The criminal investigation into the crash, however, will continue after the data is made public.